Ten years ago, Rupert Blanchard found a beautiful plaster horse in the Coppermill Market in Cheshire St one Sunday morning. At once, the quality of the design and the expertise of the painting caught his eye. Rupert was further intrigued by the initials BB upon the reverse which he had seen before upon other plaster casts for sale in markets back in Swindon where he grew up. The seller of the horse was an old man who had received it new as a wedding present more than forty years ago and now he was divesting himself of his possessions. 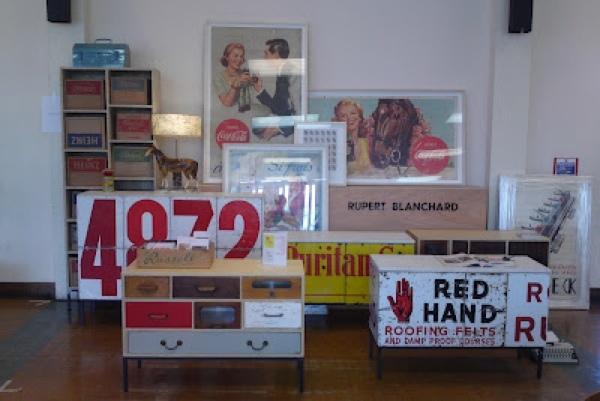 It was the first of these horses that Rupert acquired and, in the intervening years, he collected more and more at the car boot sales and fairs where he finds the things that inspire his own work as a furniture maker and designer. So fond of these horses was Rupert that he displayed them proudly alongside his own work at exhibitions. 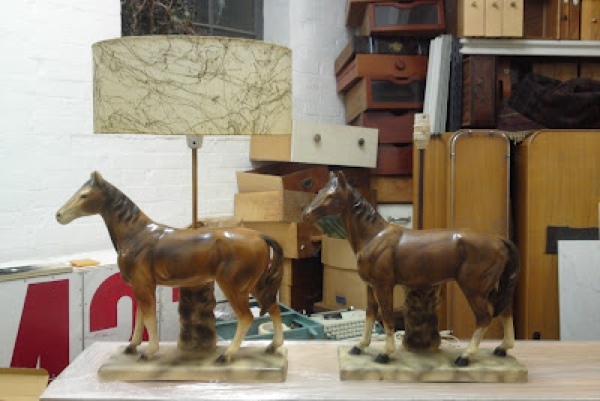 Imagine his surprise when he read my profile of Italian reproduction artist Bruno Besagni in these pages recently and recognised these plaster horses in their unpainted state in a photo of Bruno at his factory at Stratford, where he made casts in the sixties and seventies. Once I learnt of this discovery, I realised that it was my duty to introduce Rupert and Bruno, the young talent and the old master. 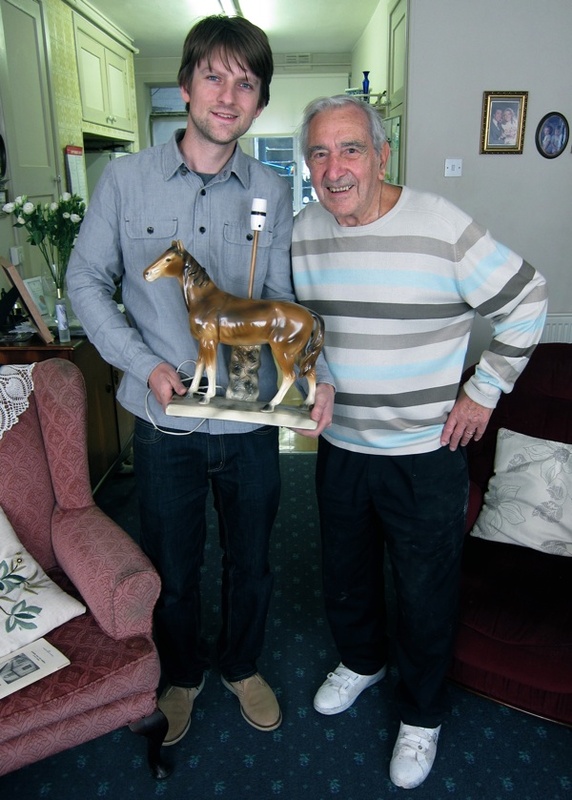 Rupert brought along the original horse that he found in Cheshire St which he keeps as a talisman. He carried it swathed in cloth and clutched it close like a baby, as we walked through the crowded streets of the Angel towards the terrace in the quiet Georgian square where Bruno has lived with his wife Olive for more than fifty years. “Yes, it’s definitely one of mine!” declared Bruno, breaking into a radiant smile of recognition, as Rupert unwrapped the horse upon the living room carpet, “I painted this one.” A self-confessed Italian Cockney, Bruno trained as a painter at the Giovanni Pagliai factory in Great Sutton St in the nineteen forties, when Clerkenwell was still the centre of the Italian community and known as Little Italy. Pagliai came from Lucca, the centre of religious statuary making in Italy, and the training that Bruno received educated him in this age-old tradition. For centuries, plaster cast sellers from Lucca had plied their trade upon the streets of London selling ornaments in popular designs for the mass market. Such was Bruno’s talent that he made the replica of the statue of St Mary of Mount Carmel that is carried in the Italian Parade in Clerkenwell each year and he has done all the repairs to the statues of saints in the Italian church over the years, replacing their fingers when they got broken off and keeping them all in good order. Today, plaster casts are no longer made as ornaments, resin has replaced plaster, which is now only used for internal architectural mouldings – making Bruno one of the very last to carry the particular skills of making and painting plaster figures. “I packed up the statues and went and did artistic work, ornamental plasterwork in hotels,” he recalled, looking back in regret,“but my love was in the statues.” Apart from a lamp in the corner of his sitting room and a mould for the bust of Shakespeare in the shed, Bruno forgot about his statues until last week when Rupert Blanchard appeared with the horse. It was an extraordinary moment of mutual recognition. Rupert, a designer at the beginning of his career, was full of wonder to meet the legendary “BB” whose initials he had seen on innumerable plaster casts. Equally, Bruno was amazed in his eighty-seventh year to learn that someone with an informed eye had picked out his work from so long ago and understood the quality of it. It was evidence that Bruno was an artist in his chosen medium and the horse was a testament to his achievement in this devalued area of design. 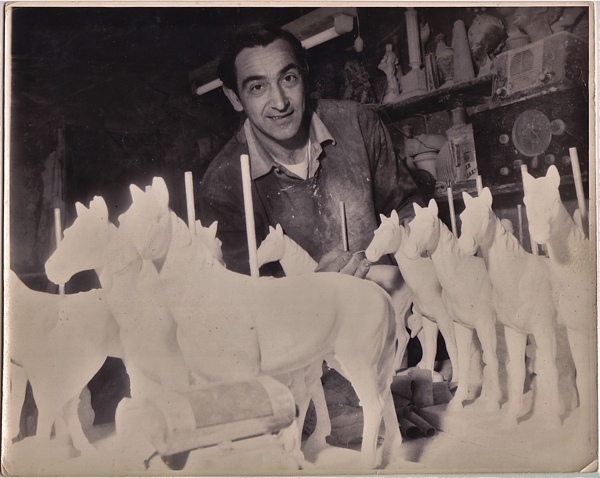 Bruno in his workshop surrounded by unpainted casts of the horse lamps that he made. 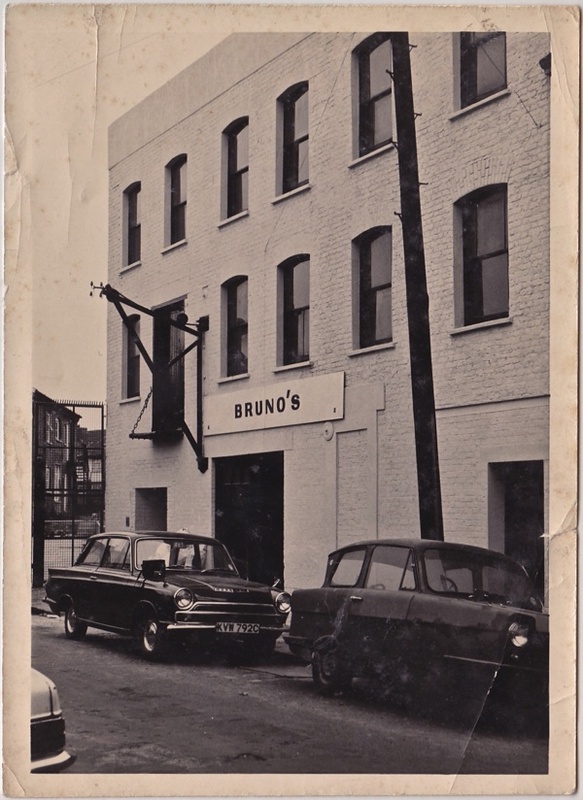 The first lamp of Bruno’s that Rupert found ten years ago in Cheshire St.
Bruno’s factory in Stratford where he made the casts. Two horses by Bruno from Rupert’s collection. 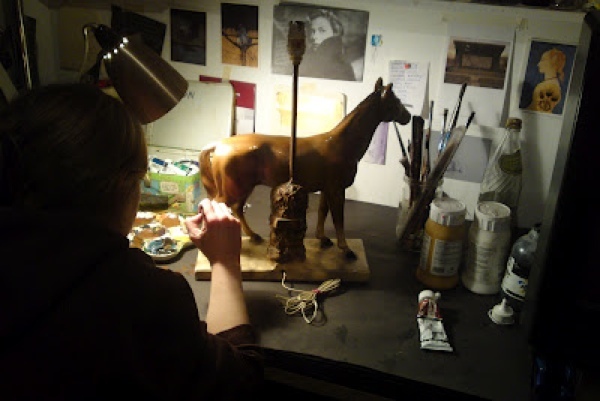 Polly Benford restores the paintwork on one of Bruno’s horses. 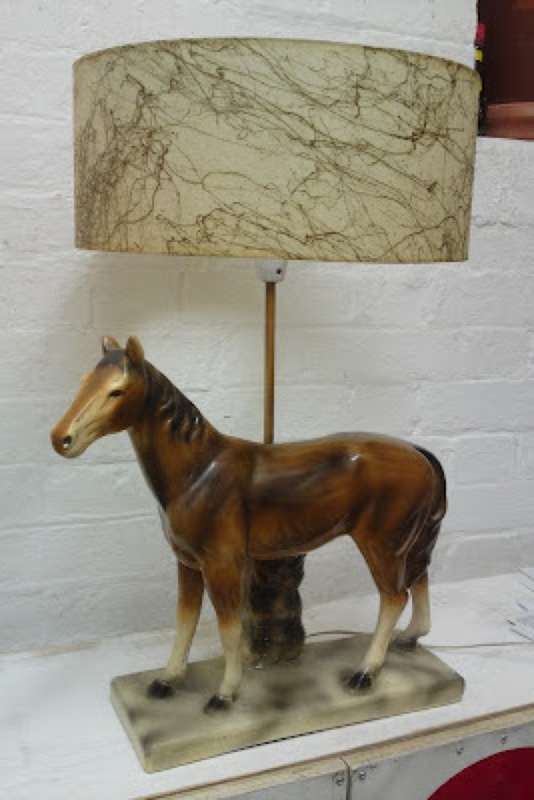 A Bruno Besagni horse lamp displayed alongside Rupert Blanchard’s furniture at Midcentury Modern. 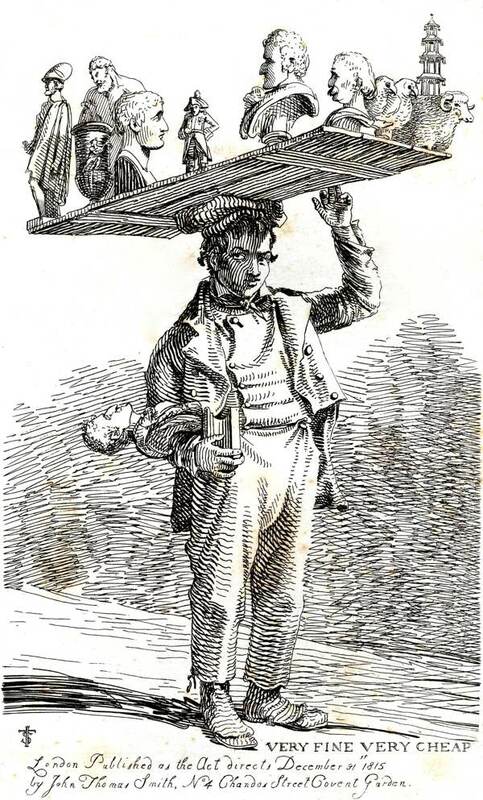 London street seller of plaster casts from Lucca drawn by John Thomas Smith in 1816. Sometimes the connections made in the world of Spitalfields Life are nothing short of magical. The Gentle Author: our sorcerer. What a great story – how lovely for Bruno to be recognised and appreciated.